As the properties of graphite and CFC materials may be adjusted to specific conditions, the materials and products made of them have also found their applications in the fields requiring low friction coefficient, thermal resistance and self-lubricating capabilities. For those reasons they are used as parts of water turbines, pumps, combustion engines, etc. 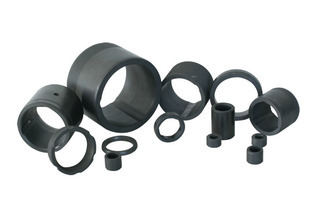 For mechanical applications we produce graphite bearings, graphite seal rings, graphite washers, graphite pulleys, graphite nuts and other graphite components which due to their parameters meet the most demanding criteria.